Life can be so stressful sometimes that we don’t even know where to turn. We usually seek for outside ways to get rid of stress like taking a vacation or connecting with friends, but a simple solution lies within a part of your brain called the amygdala. The amygdala is the emotion-processing center of the brain that receives input from stressors in your memories or daily life. It then sends signals throughout the body that affect you both emotionally and physically. Stress that stems from emotional upset can increase cortisol levels and decrease blood flow and oxygen to the brain. Over time, repeated stress activation can contribute to high blood pressure, obesity, chronic fatigue, depression, and addiction. 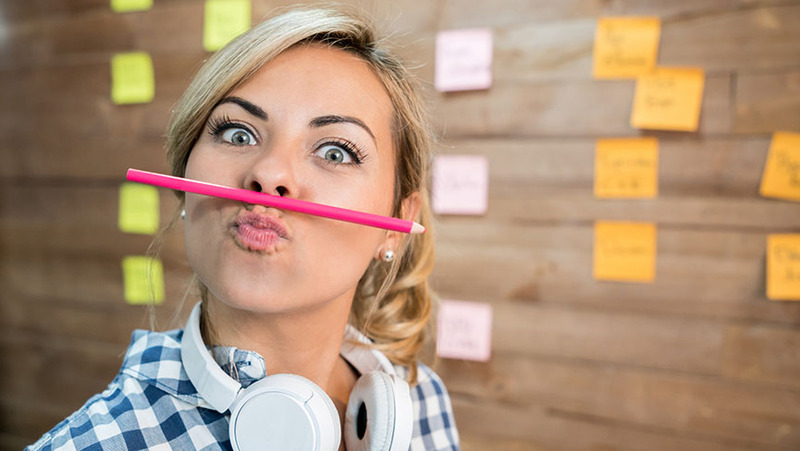 In fact, stress is the number one reason people underperform in their daily tasks. Research shows that chronic stress can even shrink brain cells, which decreases memory function and weakens creativity. Emotional regulation is critical for self-value, integrity, goal achievement, and positive relationships. 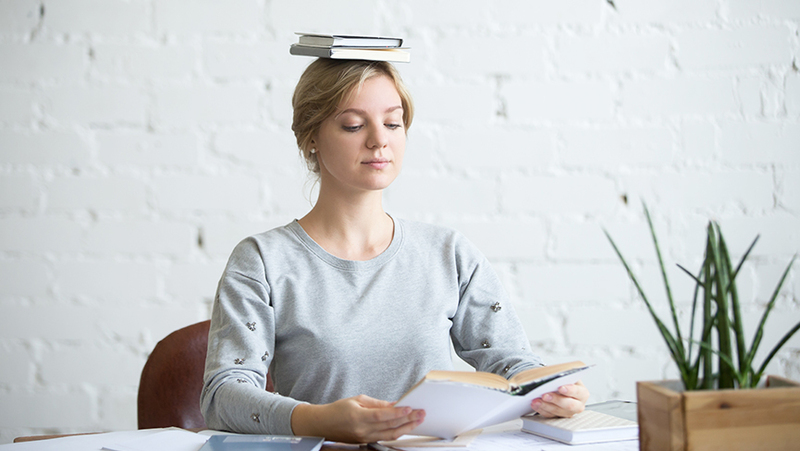 If you’re looking for ways to take control of your emotions and reduce overall stress, it’s time to tap into your amygdala with Brain Education exercises. 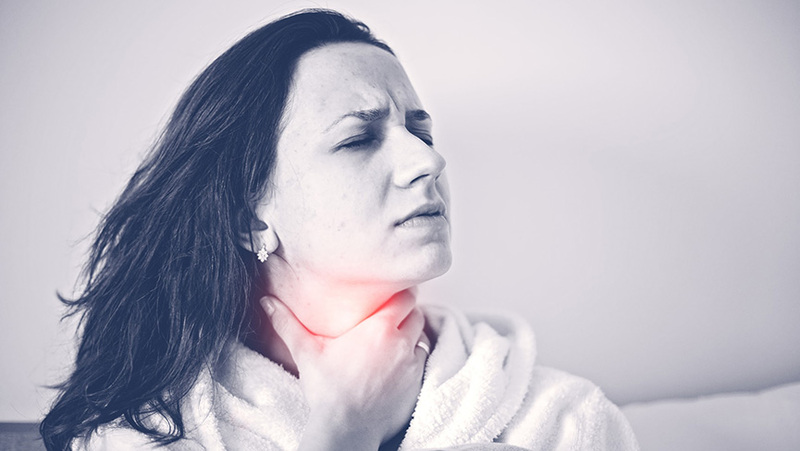 Through mindful breathing, visualization, and physical activity, one can activate the parasympathetic nervous system, which controls rest and digestion. Then, the stress hormones in the body and brain become balanced, which allows you to think and create your life more clearly. To learn how to release and manage stress through the amygdala, first it’s important to understand how the main parts of the brain work together. Let’s take a look. Where in the Brain is the Amygdala? Our brain can be divided into three main layers that reflect the three fundamental aspects of our existence: physical, social/emotional, and cognitive. These layers are thought to have evolved over time, beginning with our most basic physical drives and analytical thinking. 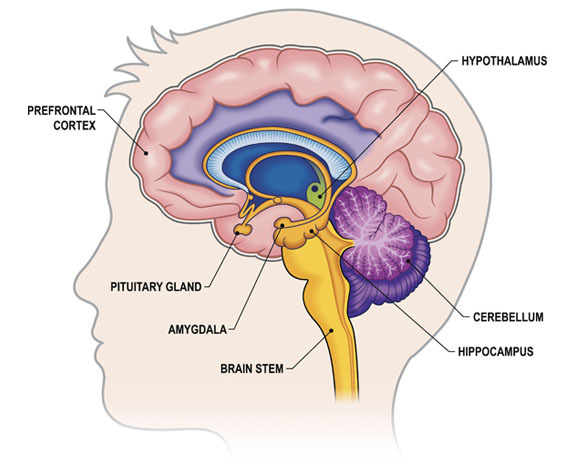 The amygdala is a small, almond-shaped structure located in the frontal portion of the temporal lobe. 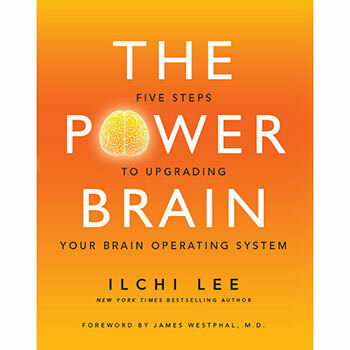 It is controlled by an inner layer called the limbic system, which is your social/emotional brain and plays a big role in transferring emotional information to the other layers that affect you both physically and cognitively. Also known as the cerebrum or cerebral cortex, this is the most recently evolved and largest part of the brain. It is the seat of higher thought, writing, and language. It grants humans the powers of reason and the ability to anticipate the future, which is why it is commonly referred to as the cognitive brain. Further inside lies the limbic system, which controls learning and memory, the expression of emotions, and the linking of past events to strong emotions. The amygdala is controlled by the limbic system and is responsible for managing the emotions of anger, fear, and sadness. This part of the brain also coincides with emotional intelligence and intrapersonal awareness, which can be stimulated by a variety of strategies, games, and brain exercises. At the deepest and oldest level is the reptilian brain. The brainstem controls basic life functions, including digestion, respiration, circulation, and “fight or flight” stress responses. It works independently of the conscious brain and holds a deep connection to the physical body. A stress-free brain is one that engages all three layers so they work at an optimal level and in a coordinated fashion. Brain Education exercises for the amygdala simultaneously involve the cognitive, emotional, and physical aspects of our being, integrating them to give people the ability to use their full potential effectively to achieve their goals. So, How Does the Amygdala Work? 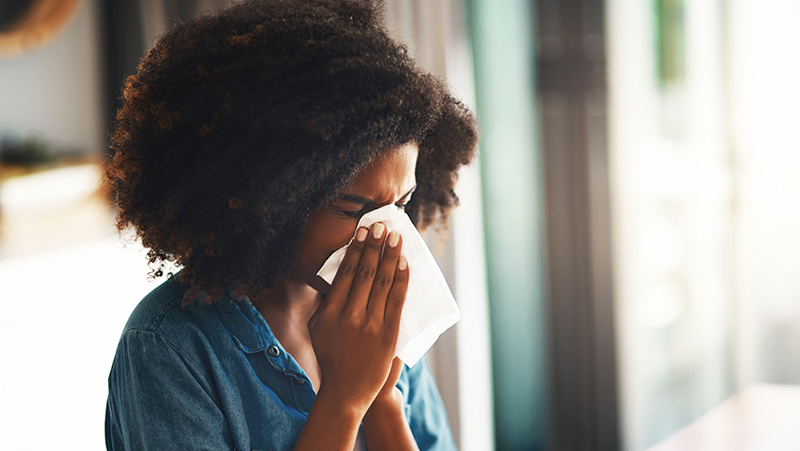 The amygdala sorts perceptions of the environment around us, and chooses which part of the brain’s emotional centers it’s going to send that information to for processing. This information can get thrown forward, to our prefrontal cortex, where we do our problem solving, or can get thrown back toward the more instinctive, primitive parts of our brain that's in charge of our "fight, flee, or freeze" functions. Emotional feedback, negative or positive, is a good thing. It keeps us tuned in to our environment and alert to both threats and opportunities. But constant negative feedback can short-circuit our brain's creative problem-solving ability, turning us into overreacting, anxiety riddled hot heads instead. This is especially true with the patterns and habits that arise from bad memories and trauma. For most people, what happens from birth to adulthood becomes so locked in the brain that it dictates thinking and behavior throughout adult life, until those patterns are challenged. Whether acting on the basis of old fears or perceiving a new threat, the amygdala acts as our guard dog. It often causes a strong, instinctual emotional response in us to protect ourselves. But when our amygdala is overburdened with negative thoughts and sustained perceptions of threats—and those can be anything from a shadow of a big hairy spider to a performance review—it can keep us in a state of unnecessary anxiety and stress. You can train your brain, however, to activate the amygdala in a positive way and stimulate more complex thinking, improve creativity, raise social and emotional intelligence, and alleviate anxiety. It’s easier said than done, but retraining the amygdala to manage unconscious patterns from emotional memories or daily stress is the first step to creating a stress-free and clear brain. This can allow you to become comfortable with directing your actions and thoughts to naturally gravitate towards better living. The following amygdala brain games are just a few of the over 360 in the curriculum of Brain Education, a program created by Ilchi Lee. 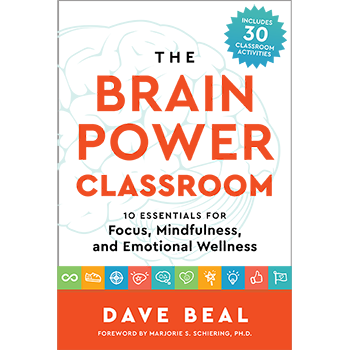 Dave Beal, a national Brain Education trainer and Program Director for Brain Power Wellness, says, "These brain games can be used to train your amygdala to act wisely, instead of reactively, in the face of perceived threats or negative situations." Calming and centering the mind is key to achieving inner focus and reducing stressful thoughts within your amygdala. One easy exercise consists of using relaxed concentration to create and sustain energetic sensations between the hands. First, straighten your spine and sit in a comfortable position. Close your eyes and begin by clapping your hands and tapping your fingertips together up to one hundred times to bring your focus there. Breathe deeply, inhaling through the nose and exhaling from the mouth. Focus on the vibration that occurs between the fingertips and the space between your palms. You may feel a warm, soft, tingling, or magnetic sensation between the hands. With your eyes closed, visualize holding a ball of energy and slowly rotating it. As you inhale, slowly stretch the energy ball bigger and on the exhale, bring the hands back together. You can imagine placing the ball in each palm and feel it getting heavier and lighter as you pass it from hand to hand. Repeat this several times. Lastly, bring the energy ball down to your body’s energy center (lower abdomen). After transferring the energy there, imagine it surrounding you in an energy capsule and open your eyes. You should feel calm, focused, and refreshed with new energy. 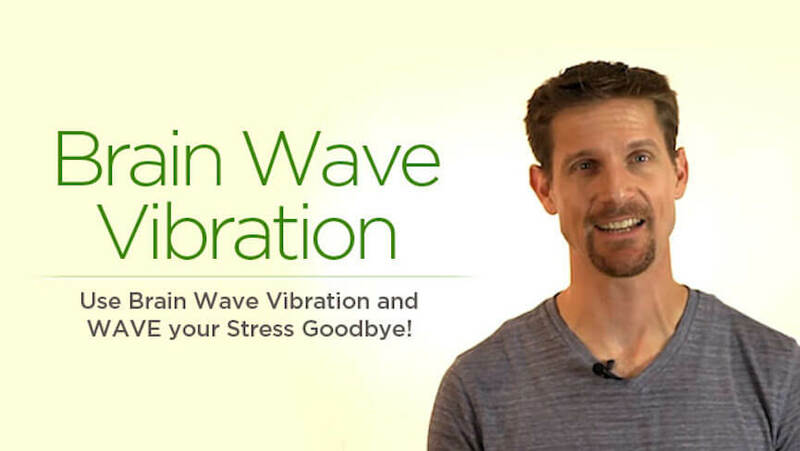 Brain Wave Vibration is a super simple, yet amazingly effective form of moving meditation to shake off negative emotions, fatigue and everyday stress. The brain emits five distinct kinds of brain waves: alpha, beta, delta, gamma, and theta waves. We spend most of our waking time in high-frequency, beta brain wave patterns. Low frequency brain waves, on the other hand, are emitted during times of rest, relaxation, and meditation. With a calmer mind in a lower frequency, the amygdala can banish negative, fear-based thoughts and realize greater focus and centeredness within. 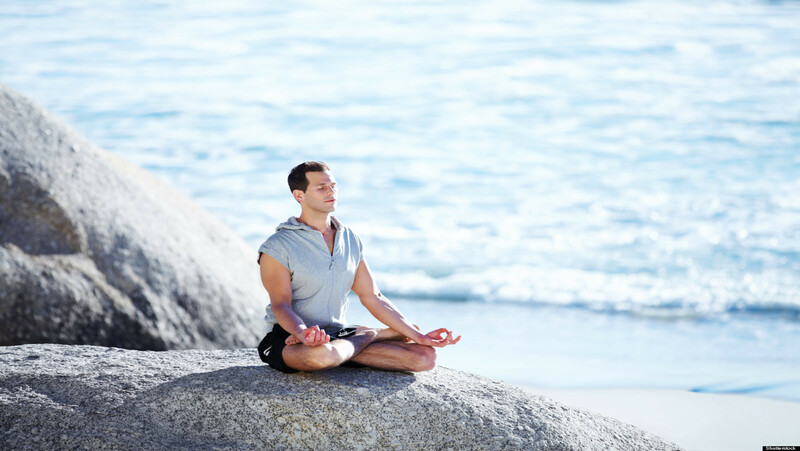 Simply sit or stand in a quiet space, take a few deep breaths and start swaying your head from side-to-side. You can sway with your eyes partly or fully closed. It helps if you put a smile on your face while swaying, and go inward toward your positive thoughts. Turn your head slowly, first to the left, then the right, continuing this slow 'wave' for as long as you like. 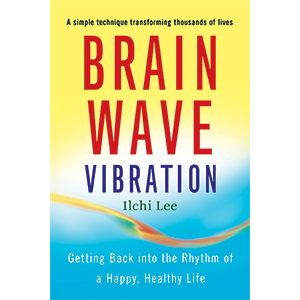 Brain Wave Vibration really does clear your head to make room for solutions to your everyday problems. Laughing is a great physical workout—great for strengthening abdominal muscles, improving energy circulation and relieving tension and stress throughout the body. Laughter also produces endorphins, or “happy chemicals,” which trigger a positive feeling and change your mood to being happier, thus retraining the emotional feedback system in the amygdala. Even when we have no outside reason to laugh, the simple act of laughing lowers cortisol levels and balances levels of serotonin and dopamine which help us feel naturally great. Laughing exercise takes a little practice to get going because, at first, it may feel forced. But laughter is also contagious and soon, you'll go from laughing about nothing to laughing about laughing. You can do this by yourself, with a partner or a whole riot of people. Just settle into a comfortable spot, break out a big smile and start gently giggling. Then work yourself up to a full-blown laugh. Keep building until you've forgotten whatever it was that was making you feel blue. Your whole body will feel lighter and you'll be able to tackle your problems from a calmer, more level head. Like magnets, our bodies produce electromagnetic energy. But stress, negativity and emotions can distort our energy fields. Magnetism can clear your mind of those negative thought patterns by resetting the neural pathways in your brain’s limbic system. With calmer brain activity, the amygdala can become more receptive to positive thoughts. Get your electrons back on track with magnet meditation. 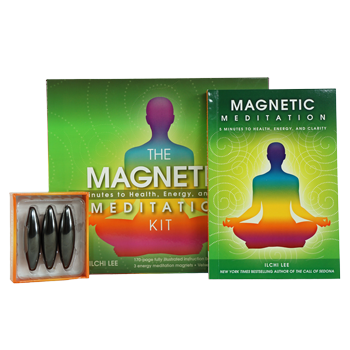 Or have fun playing with energy with the Magnetic Meditation Kit. A simple exercise is to take two magnets and practice holding them in your hands, pushing them as close together as you can without letting them touch, then pulling them apart, just past the point where you can no longer feel their energy. 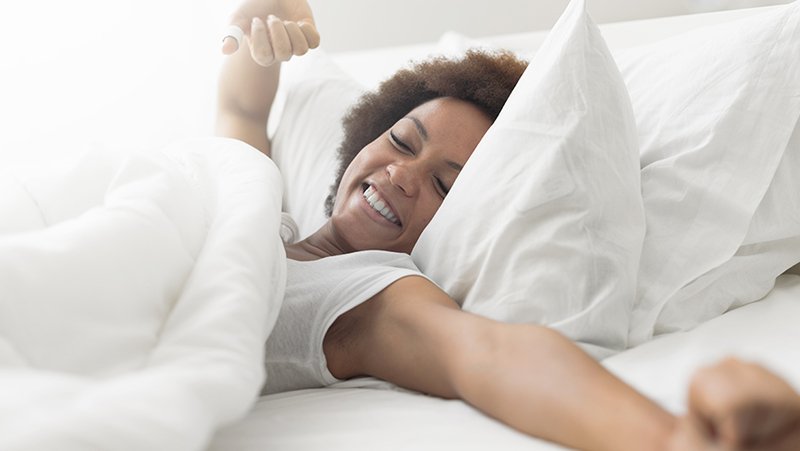 It's a great, seemingly mindless activity that is actually resetting your brain! Since the amygdala is the command center of your emotions, it is helpful to identify where your emotions are coming from, learn to accept them, release them, and see that you have the ability to create future stress-free happiness. First, identify your emotions and understand that they are temporary states that can be changed. You can simply think about them or write them down in a journal. These emotions are not who you are. While you experience a range of emotions, they do not define who you are, what you stand for, and how you live. You do not need to attach to your emotions, especially the negative ones. Next, try to accept the emotions you are feeling. When you can accept your emotions honestly, you can begin to lessen the grip on them and realize that they should not affect you as much as they do. When you want to change your emotion, you can release the negative ones by telling your brain to change your mood. Simply forcing a smile or smiling as you take deep breaths can trick to brain into making you happier and release negativity. Finally, when you partake in happy actions, you can create happiness. Through taking action, you can easily change the way you feel. By following this pattern of identifying, accepting, releasing, and creating, we are able to choose our emotions and work consciously to feel the way we want to feel and retrain the amygdala to release stress from our lives. Typically, we tend to store negative remarks made by others about us in our memories. But a good compliment can have everlasting effects too. Share the good vibes with your friends or family with the Compliment Game. This could even be a great team-building exercise that can lighten the mood and energy frequencies of an entire workplace! Simply sit in a room and form a circle. Hold a beanbag and choose a person, next to you or across the room—you decide—and, as you're tossing the beanbag to them, toss them a sincere compliment as well. 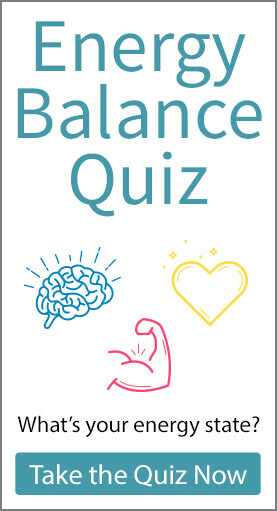 Whenever you find yourself facing an anxious situation, give your amygdala a workout with these brain games. Play them before a job interview, a difficult conversation, or to clear past memories and create a calm inner environment. Then, see what a difference an amygdala with a positive sense of direction can make to your life! If you'd like to continue taking care of your brain and learning to live life beyond your emotions, you’d probably be interested in our Jigam Ki-Energy Meditation course. This course teaches the art of Jigam and how ki-energy can be used to become more grounded within and gracefully ride the waves of your emotions. Gabi is a creative mind who loves deeply connecting with the people around her. Using music as a tool of inspiration, you can find her at concerts or music festivals in her free time. She has practiced energy healing and meditation from a very young age and loves encouraging others to keep a positive mindset to become happier, brighter, and more successful. All these exercises helped me heal, be pain free, enjoy a happier, healthier, and positive life!